Please note this feature is only available to hubbers who have at least 10 published and approved hubs. There have been so many forum postings and questions about Webmaster tools and whether or not you can add a sitemap to hubpages. There have been many incorrect statements too. It may have been true that at one time you could not do a sitemap for hubpages on Google Webmaster tools, but the statement is not true today. You can add/create a sitemap for your hubpages and add it to google Webmaster Tools. I am not talking about just creating an account with Google Webmaster Tools, but actually adding a sitemap to Hubpages. In order to add a sitemap to Google Webmaster Tools for your Hubpages subdomain, you first need to signup for a Google Webmaster Tools account. If you have already been approved for Google AdSense or use Google Analytics then you have already created a google account and can sign in with that account information. If you have not been approved for Google AdSense or do not have a Google Analytics account then simply click on the red "Sign Up" button in the right hand corner of the Google Webmaster Sign In screen and follow the prompts to create your account. Once you have logged in using your Google Account, then you need to add your Hubpages Domain site to your site list. On the home screen, you will see a red "Add A Site" button on the right hand side of your screen. Click this button and then enter the url of the Hubpages site. Enter your Hubpages name (without spaces) where is says "yourname". Click continue. If the URL was entered correctly, you should see your Hubpages site added to your dashboard homepage. Now that you have added your Hubpages domain to your Google Webmaster Tools account, you can now add the sitemap. In the dashboard select your Hubpages domain and it will take you to the dashboard for that site. (You can add other sites to your Google Webmaster Tools account). Click on the Sitemaps section at the far right of the screen. 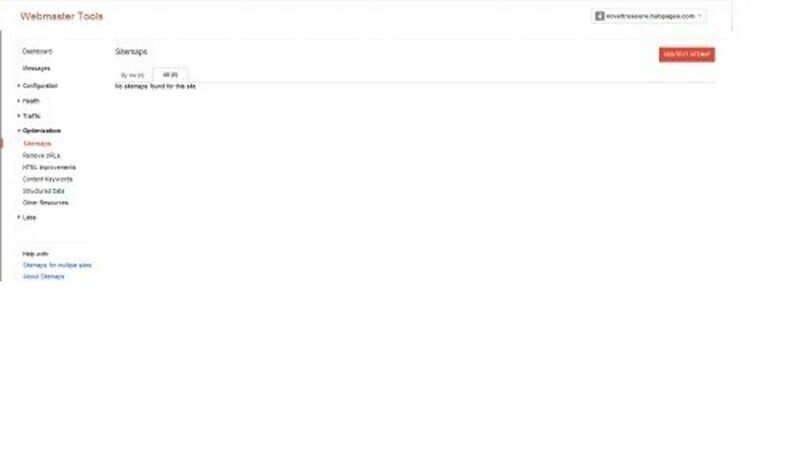 The screen will show 0 sitemaps and a note that "No sitemaps found for this site." Click on the red Add/Test Sitemap on the far right of the screen. Where it says "yournamehere" you will enter your Hubpages name with no spaces. After entering in the sitemap text, I recommend testing the sitemap first. However, if you are comfortable you enterered it correctly, you can skip this step and move on to Submit Sitemap instead. To test sitemap, cick the Test Sitemap button. It will process the test and then show a screen that says "Tests Complete!" and there is a button to "View Test Result". Select this button. If the sitemap was entered in correctly you should see your sitemap and the number of webpages submitted. Do not stress if the number of webpages submitted does not exactly match the number of webpages indexed. You can fix that later. Special Note: Some people were experiencing 404 errors when trying to submit their sitemap, if you are copying and pasting the text from above, try removing the bold before submitting. It has worked for a few people. Click the "Submit Sitemap" button. You will see a screen that says "Sitemap Submitted" and you will see a red and blue graph that shows the number of webpages submitted and the number of webpages indexed. Do not worry if they do match. 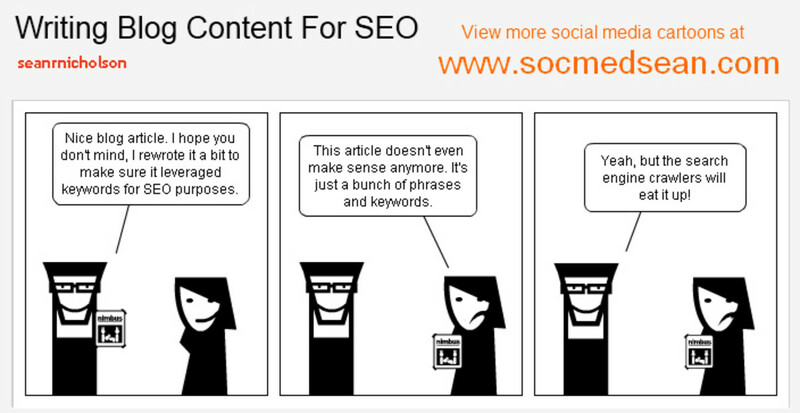 It just means that Google has not indexed those sites yet. You can either wait for the google bots to crawl those urls or you can manually "Fetch as Google" later. Congratulations! You have just added a sitemap for your Hubpages domain. 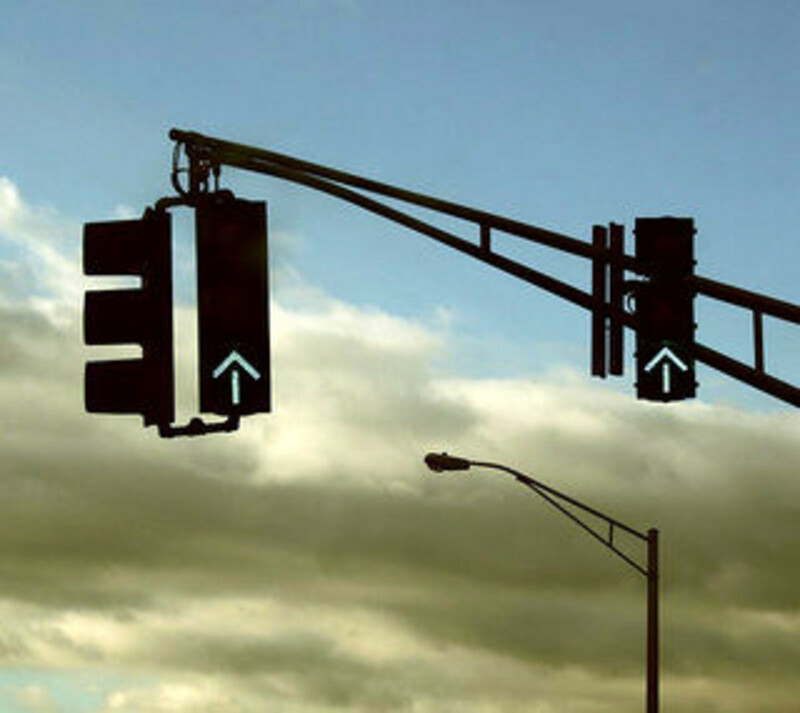 What does that mean for your Hubpages traffic? 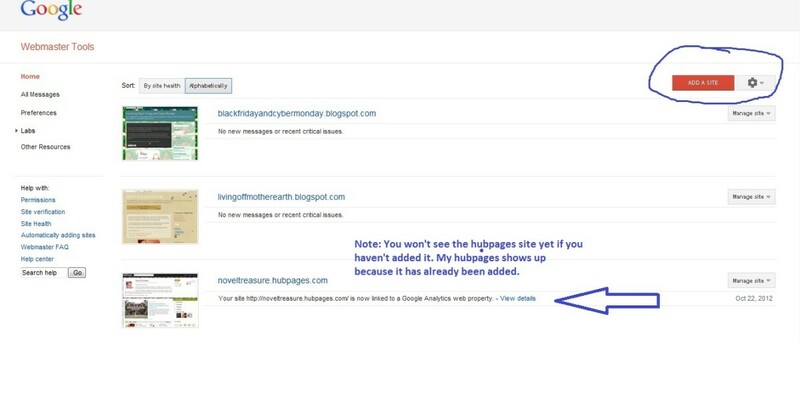 Adding a sitemap for your Hubpages domain, allows you to tell Google about your hubs that the Google bots might not discover during their crawls. This is great for new hubs that have zero to few incoming links to the hubs yet. In addition to telling Google about all your different hubs, you can also tell Google how often your hubs were updated and how often you expect to add new ones. This will help tell them how often to crawl your site. Google does not guarantee that every hubs submitted will be crawled and indexed. However, it gives your hubs a chance to be noticed that may not normally get that chance. Thank you for your comments and your constructive criticism. I think you definitely have a point and will be updating the title shortly. Thanks for the help!! 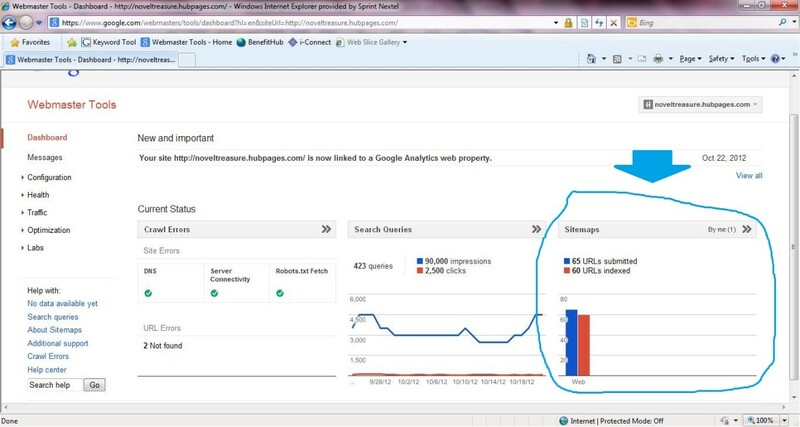 I believe you are talking of adding the hubpages sitemap to google webmaster tools. And I have been able to add it sucessfully the first time following your hub. However in that case isn't the title misleading because nowhere have you explained how to add the site map TO Hubpages? Thanks for the info. I thought submitting a sitemap is like programming but I've managed to do it. Novel, I found this hub in Google search. It was listed second. Great easy to follow information, and helpful. I have been unsuccessful in submitting both the sitemap by following your instructions. I have tried to test and submit it in both sitemaps/hub/current/sitemap-hub-liladybugz26.xml.gz and sitemaps/hub/current/sitemap-hub-liladybugz26.xml.ga forms. Description- Your Sitemap appears to be an HTML page. Please use a supported sitemap format instead. I tried to find an answer all day yesterday, and the only thing I could come up with is a hosted sitemap solution that charges $4.99 to host the sitemap on their server. They also link up directly to Google Webmaster Tools and submit the submap automatically. Thank you so much, I would still be lost without these easy instructions. After three years on HubPages---I am still learning. I feel like the cow tail--the last one to get it right. I will share with Twitter and pin it on my re-pin board. I'm wondering if we might get better troubleshooting results if we posted a question in the forums to see if anyone who received the 404 error when they were registering their sitemap, was able to get around it and how they did it. Hi Rymom28, I'm sorry it's not working for you. I was able to do it by following the steps that I described. Not being too tech savvy, I'm not sure why a handful of people are having issues. I know a couple have tried again a few days later and been fine, one removed the bold and was fine. I do know that it is possible because I have the sitemap. With the hubpages coding that I listed it will allow you to get a sitemap. You have to register with webmaster first though. I'd really like to find out how you or others got this to work. From all the research that I've done, what others have concluded is that because we do not own or create the actual website we can not add a sitemap. I tried typing it in without bold and I am still getting the 404 error. As for the need to have 10 hubs published and approved to be able to do this; I have that, so what am I missing? Any help would be appreciated. Thank you, Novel Treasure and MelRootsNWrites. Unfortunately that doesn't seem to be the problem for me. The last time I tried I copied the text directly from Novel Treasure's comment, which wasn't bolded. But I tried again just now, even copying it into Notepad first to make sure there wasn't any leftover coding. I got the same result. Still hoping for a solution, as this would be a great thing to be able to do. Thanks for your continued efforts to help me troubleshoot the problem! hi Margaret, melrootsnwrites was able to get it to work by getting rid of the bold and it worked. Not sure if that's what the issue was, but try removing the bold. I'm back to give an update. I'm not sure if this made the difference. I noticed that the line to copy and paste was in bold. So, I thought perhaps it was picking up some formatting that I couldn't see. 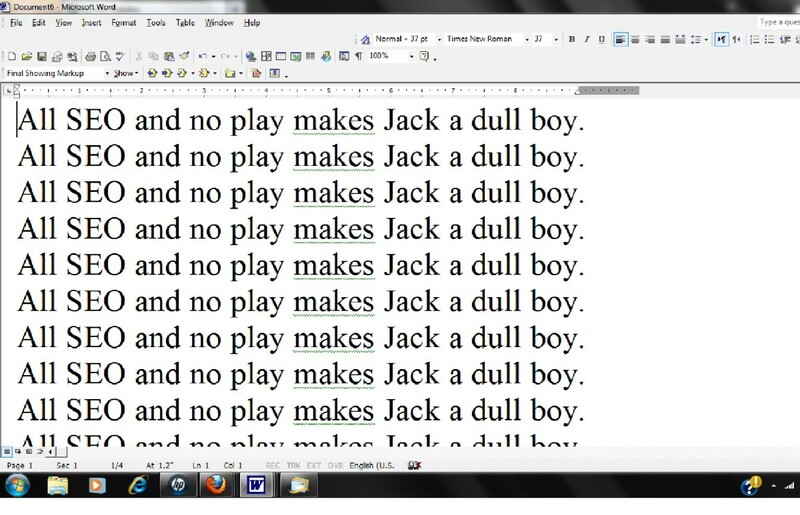 At any rate, I copied the line to a text file and got rid of bold. Then, I recopied that line to Webmaster Tools. It worked the first time. So, I either figured it out or it wasn't working the other day and I manage to hit the right time to try again. Thanks for your instructions! They were very helpful! Quite a few things to look at I'll have to do more research and come back to this hub...thanks to the author! Thank you very much for trying to help me troubleshoot the problem. I'm sure @MelRootsNWrites appreciates it as well, since we're experiencing the same issue. so you typed in sitemaps/hub/current/sitemap-hub-margaretschindel.xml.gz and it still gave you the error. There should be no spaces in your entry. Were you at least able to do the first part and add your hubpages site to the dashboard homepage? Or was it giving you the 404 error from there? I had the same problem as Margaret Schindel. I copy and pasted the line that was provided. I replaced yournamehere with melrootsnwrites. I lcikced on test and it gave me a 404 error. Any help appreciated! Thanks! Hi! I just tried adding my sitemap to Webmaster Tools following your instructions. Like commenter Traci Ruffner, I tested the site map and it told me there was a 404 site not found error. Can you please tell me how to fix it? I copied and pasted your example and then replaced yournamehere with my subdomain name (margaretschindel), so I'm not sure why it's returning a 404 error. Any help would be greatly appreciated. And thanks for the very clear step-by-step instructions! What I don't understand is why all of my hubs are on part of the site map! Thank you for the sharing and repins. I had seen some other articles on hubpages about it, but to me they weren't user friendly. I am also not a very technical person so rewriting it like this helped me understand the instructions too. I would go ahead and do the sitemap now and get it setup, because then once you update your squidoo articles and publish them the sitemap will automatically include them once they have been indexed by google. This was a God-send--THANK YOU!!!! I'll check this out and make sure my site map is still working. Thank you for the detailed instructions for making this user friendly to someone non technical like me. I'll be sharing and pinning this one so I can go back and use it again. Thank you for providing this tutorial. I only discovered the possibility of sitemapping our HP account last night, then serendipitously stumbled upon your article this morning. I do have a question. I am one of the former Squids whose account was moved to HubPages in the merger. As you may know, we have been given four months to update our articles to comply with HubPages formatting and rules. I work on a couple nearly every day, but it will be awhile before I finish updating all of them. In your opinion, should I wait to do the site map until I've completed editing my hubs? Or should I go ahead now? I would appreciate your explaining the advantages of either doing so or waiting, if you can. If you prefer I post my question in the forum, please advise, and I will take it there. Thanks for this! I was lost until I found your article and completed all the steps in just a few minutes. Great article with easy to follow instructions. I especially appreciated the pictures. Voted up! Site map added. Thank you so very much for an easy to follow, step by step explanation of adding a site map. Very helpful... thanks, I have done this now. I'm glad to know this was helpful to you! I just did this and it showed up only 28 hubs out of 76. I went back to my statistics page and counted. Sure enough, the site map is only counting those hubs that are not Editor's Choice. The Editor's Choice ones are being indexed and sitemapped by Hubpages. I looked again at my statistics and noticed that traffic is not affected by Editor's Choice hubs. In other words, whether HP sitemaps my hubs or they're sitemapped under Watergeek, it appears to be irrelevant to search engine results. I still get good traffic to certain non-Editor's Choice hubs and no traffic to certain Editor's Choice hubs. Can you be more specific on what exactly you would like me to clarify. It still works with HP, as I use google webmasters daily to see my search content and queries and it is through the sitemap that I get this information. Good advice. Thank you for the post. But I don't know if it works well with HP as commented by someone here. Your clarification required. Please advise. Waawwww... very useful to me. I have tried to follow the steps you have outlined above but Google Webmaster now requires the verification/ownership of the site. Since I only have access to my subdomain, I cannot verify site ownership. Any ideas? Yes. That's what it said. Site not found. Thank you for the extra tip for the RSS feed. I was not aware that there was a work around for new hubbers that did not yet have 10 hubs. That is an excellent tip! To Novel Treasure, actually, you are right in your point of view. Today, I have again checked your sitemap and it's somehow working! I downloaded your xml sitemap and checked it. I don't know why it was not working yesterday when I checked. However, you can't actually ignore my points as well as suggestions. It is really a technical issue with HP (hubpages), because your method of sitemap submission is only applicable when you have 10 or more featured posts. But with less posts in a HP blog, no one can actually submit a sitemap following your instructions. The only reason for that is HP disallows those hubbers, because HP needs to verify that those hubbers can produce high quality contents on a regular basis. And, when this verification process is done, HP enables them to submit a xml sitemap. However, by following my ways, those bloggers can still submit a sitemap in google or bing webmaster tool using their RSS feed. I hope you will now understand my point of view. To Medical-Reference: you wrote "But your suggest sitemap url "sitemaps/hub/current/sitemap-hub-noveltreasure.xml.gz" doesn't work anymore. It just sends to a 404 error." This is not true. I am afraid you misunderstood the instructions. My site map works just fine. They are not a url that you can go to, they are for the adding my site map to the google webmaster tools. So you would not be able to have access if you tried to type it into your web browser. So its not that there is a technical issue with hubpages, it is how you are following the instructions. Also, someone should not have to individually enter their site maps for each hub or even do the best, latest, and hottest. Once you have the sitemap, it will automatcially pull in the new hubs into the sitemaps. I'm sorry you are confused by the instructions. If you tell me your specific questions I can try to help you. Honestly, you have done a great job by writing this post. But your suggest sitemap url "sitemaps/hub/current/sitemap-hub-noveltreasure.xml.gz" doesn't work anymore. It just sends to a 404 error. I was hopeless finding a solution of this issue. But where there is no solution, there is a solution. I have multiple sites in other platforms and I always knew that there is a way out for submitting a sitemap to google webmaster tool. Many other platforms like tumblr, blogger, or wordpress hosted version let users submit sitemap in different ways. So I was just looking for the root Atom or RSS feed for a hubpage blog. And, I finally find out the root rss url. Additionally, I need to mention that hubpages.com have a technical issue with submitting sitemaps. As google punishes low or poor quality contents, hubpages.com doesn't want to let google index all types of contents. So they just coustomized every hubpage blog in three different categories - hot, best and latest. I guess you already understood that hubpages.com actually don't want all our contents to be indexed and I believe for this reason they don't provide an option for submitting a sitemap for all the contents. However, by following the below way, you could actually submit sitemaps to google webmaster tool though it is not necessary. So, if you want to submit sitemap for your latest hubs just copy "hubs/latest?rss" and paste in "add sitemap" section of google webmaster tool. This same rule will be applied for the "best" and "hot" RSS. Consider submitting all three RSS url, I believe that will help increase search visibility. In addition, I need to say by this way you will never need to go back to your sitemap section for updating, because all the urls will be updated automatically. Novel Treasure, how often should we submit our Hubpages sitemap, or is it a one-time off thing? For my own websites, I have to update my sitemaps every now and then. Amazing! I've been trying to do it without any success but now it's finally done! Thank you Novel Treasure. What else can I do, other than vote this hub up with UABI?!!! Very useful thanks so much for writing such an informative hub. Voted Up and Useful. I will definitely check it out. Thanks for giving me a heads up. Much appreciated! Novel Treasure, looks like you may have to update your section, "Adding Hubpages Sitemap to Webmaster Tools". I think Google has changed its format. There's a forum thread on this topic. Figured it out. You must have google analytics enabled to verify; it can't be just adsense. Eerything went smooth after I enabled analytics. Thanks! I understand its part of the setup. But how to you add the html code that google asks you to add to your homepage? That is part of the setup process. Maybe I am missing something here. Google webmaser tools is asking me to verify my site. Any ideas? Wow,never thought you could add a sitemap for hubpages!Thanks for the information!Great hub! I did not know that it is possible to add a hubpages sitemap (except an rss one /hubs/latest?rss) so far to webmaster tools. Thanks a ton for the hub! Voted up! Hi Novel Treasure - I'd never heard of this before! I have just published ten hubs so I think I'll give this a go:) Thank you very much for this useful hub! Thank you for the kind comments. I so glad to hear that you found this helpful. I know it was so helpful to me when I first found out about it. Love you novel treasure what an easy to adding a sitemap on hubpages. Seriously i really don't know before this that we can add a sitemap on hubpages. Once again thanks. hi, thank you for this, I don't have a sitemap on my domain yet. Your article is useful. Keep posting! You really broke this down well, and made it very easy to follow! Thank you for the great hub! Thank you. It's really nice to hear that this is easy to follow. That's what I was striving for. Glad it helped! You made this so easy to do. Thank you so much for publishing this hub. very useful information...i finally submited my sitemap..
i will try it - thanks! Excellent hub. I did added my hubpages sitemap to Google webmaster some months ago and my traffic did climb up and it has been steady for some times. after the hub url in the add sitemap area on my google account - Am I adding the correct text??? Hmmmm I wonder what the issue could be? You have setup the hubpages account first? Maybe is there an / in the rift spot? and always get an Error message!!! I'm glad you tried again and it worked! But it must have been a glitch because I went back in and tried it and it worked! I'm not sure what the difference is between the two you typed. Are you sure you have a sitemap availble yet? I believe you have to have at least 10 hubs before HP will setup a site map for you. Glad you were able to follow and successfully add your sitemap. Very useful hub you got here. Easy to follow steps and instructions. Added my page sitemap, though not all were index. Thank you. Voted up and useful. Thank you brakel2. I too had seen my traffic plummet in September and was so dejected. I did the sitemap and my traffic started to climb back up. I don't know if the two are related, but I am hopeful. Good Luck! I did it, and I am so proud of your hub. I made a sitemap and submitted it with your simple instructions. Ever since my new profile page, my traffic has deteriorated. I am hopeful that your creative ability will result in more traffic for me. If it does not, I still believe that you have made a difficult task easier for everyone. I have shared your hub and hope all will like it as much as I do. Good luck with all your writing. That's a great tip. I was wondering how to put one on for my blogs. Thank you very much! By adding this robots.txt you will always be able to find you're sitemap on sites like hubpages, blogger, ... If you want a sitemap on a site you made from scratch ofcourse you have to add it you're self. Thank you, I had heard that but hadn't been able to verify it. I will update the hub with this info. You can only do this after you have 10 published and approved hubs. Other wise you will get a 404 error. You can check this by adding /robots.txt after you're hubpages domain. If the # is gone before the sitemap it will work. I have to give much thanks to InternPete for turning me on to sitemaps. I know some people don't want to share their secrets, but I have seen my google traffic go back up after this. So I wanted to share. I have followed your advice and I have two sites pending. I really didn't know the importance of a site map until I read your great hub. Thank you. Awesome! I'm glad to hear people can follow the instructions. I just created a sitemap now I need to create a sitemap for each blog. Thanks Great Instructions! Very good hub - great info and so easy to follow. Voted up! Thank you. I am really hoping it is helpful to other hubbers. This looks good - I'm going to use this - thanks . . .